My yoga teacher Barrie asked me if I’ve ever done a cleanse. I wanted to answer, “Why, do I look like I need one?” But that didn’t seem polite, so I just said “No.” Then she asked me if I’d be interested in joining in and bringing the cleanse to the Jittery community. It’s a three-week proposition, taking place in October, and apparently you consume enough to feel good and get through your day. Um, how much is that? 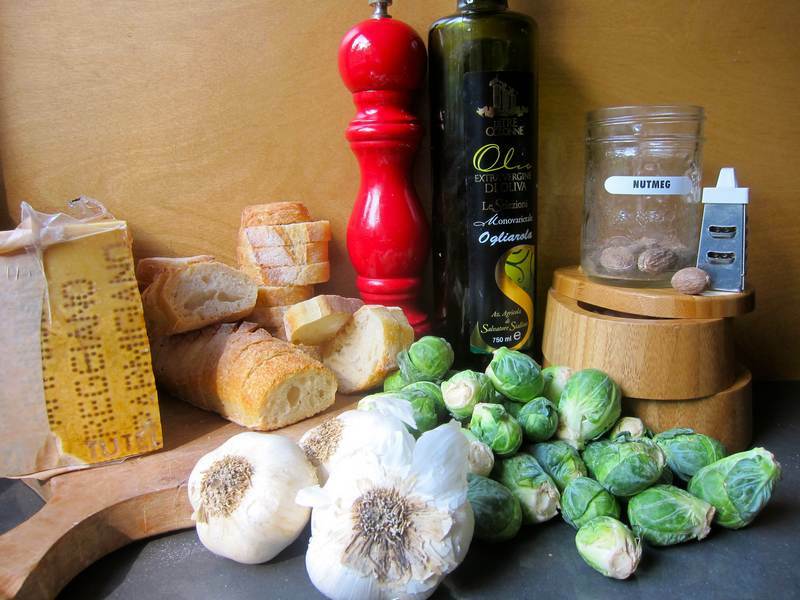 On to Brussels sprouts…Do you love them or hate them? My husband calls them depth charges because they hail from the cabbage family. Seriously. He also doubts the credibility of any nutritional advice. I wonder if he’ll be into following the cleanse. Here are three pre-cleanse treats that will leave you grinning ear-to-ear. I know because I tasted them. Heat 1 tablespoon of olive oil in a large pan oven medium heat. Add Brussels sprouts, salt, pepper and nutmeg. Cook for 10 minutes, stirring occasionally. Remove from heat. Stir in grated parmesan cheese and 1 tablespoon of olive oil. Spread garlic onto bread. Add cooked sprouts, then shaved Parmigiano-Reggiano. Serves 12-16. Coat the toasted baguette with a layer of goat cheese. In a medium-sized bowl, combine all the remaining ingredients, seasoning them with salt and pepper to your taste. Spoon the sweet pepper mixture over the toast. Serves 10. Preheat oven to 350 degrees F. Place baguette on a baking sheet. 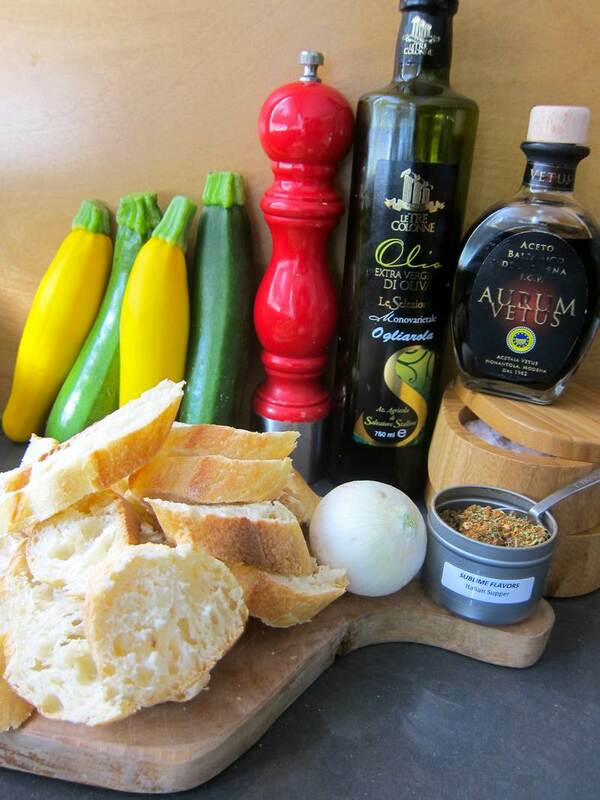 Brush with 2 tablespoons of olive oil. Bake for 8-12 minutes. In a large bowl mix the zucchini, onion, Italian spice blend, salt, pepper, olive oil and balsamic vinegar. Let sit for 5-10 minutes for the flavours to meld. Taste to adjust seasoning. 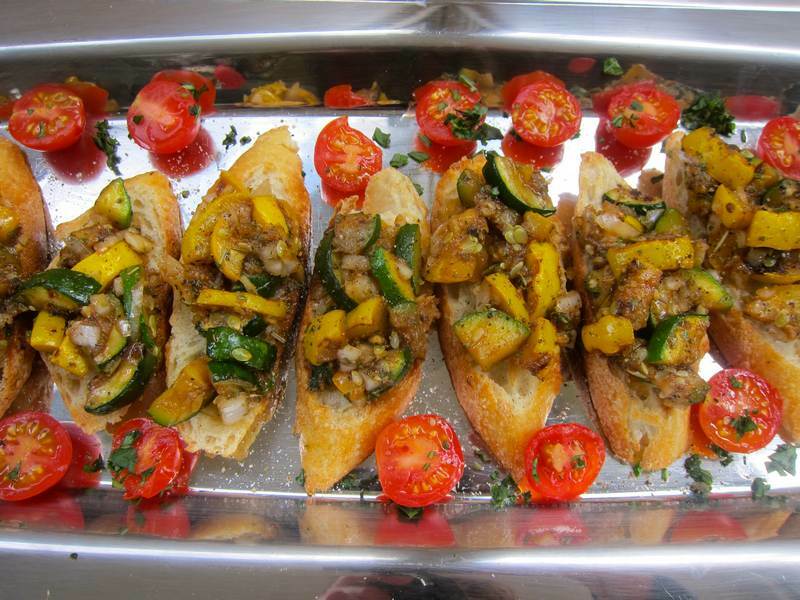 Spoon zucchini mixture over toasted baguette. Try one to see if additional salt and pepper is required. Makes 16 crostini. Serves 8, which is my way of saying that I reluctantly stopped after 3. Thanks, Steve! 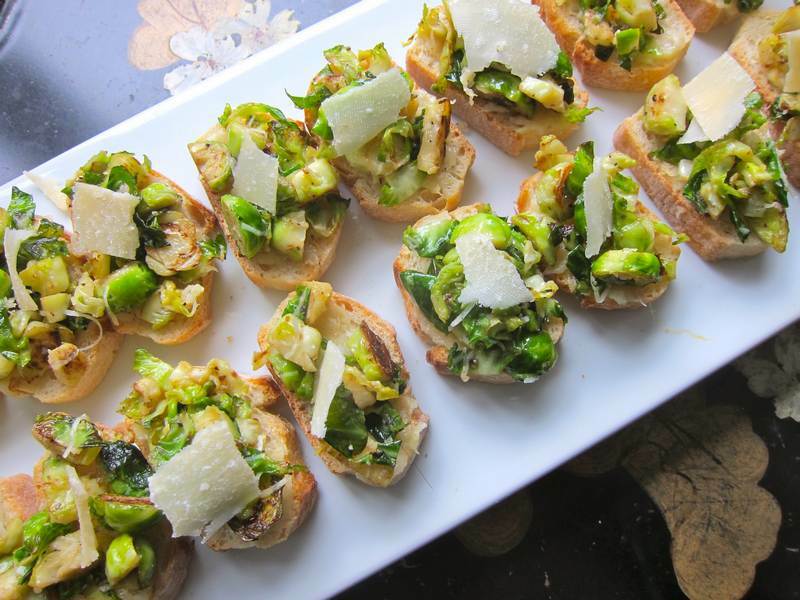 Thanks to Marley Silverstein for introducing me to Jessica from How Sweet It Is and her recipe for Brussels Sprouts Crostini. Jessica is clearly a food genius and I think I love her, even though we’ve never met. Do you want to know what produce is now in season? Today is the 2-year anniversary of the Jittery Cook blog. Remember first post from September 11, 2011, Jittery Cook Dinner For Two? Are you ready to take the challenge of joining in a three-week cleanse? Follow along on Jittery Cleanse. I figure that after 250 Jittery Cook posts, a cleanse may be in order. Sounds yummy…. I know several people who would be interested in the cleanse… and lets get together! Would love to get together and continue bonding over cleansing! 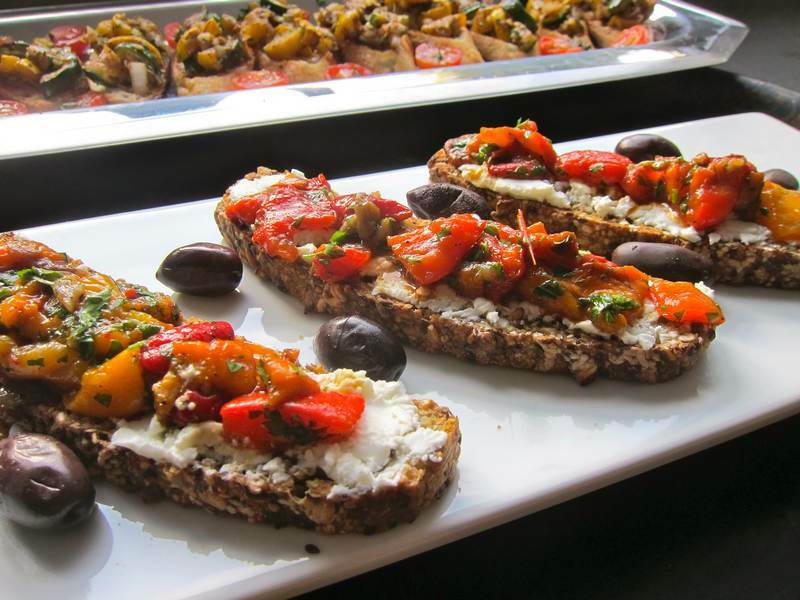 A crostini for everyone – if you don’t like brussel sprouts – then have zucchini. Great post. Choices! Something for everyone. And if you like all three, that’s even better. About no chance Marvin would do the cleanse. More chance I come. You know Marvin…I’d say there is more chance that you’ll do it. I’ll be calling on you for inspiration. 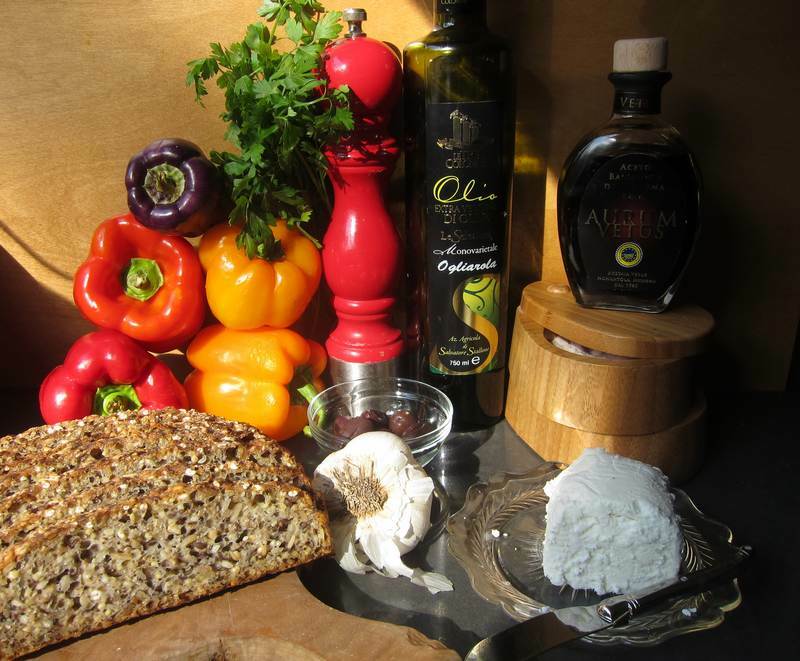 Where do you get 10 year aged balsamic? I buy directly from http://www.sublimeflavors.com/catalog/sublime_flavors_dc.pdf You can contact them or ask in a gourmet grocery store. I can’t get any of your recipes.